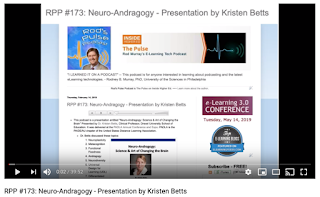 This podcast is a presentation entitled "Neuro-Andragogy: Science & Art of Changing the Brain" Presented by Dr. Kristen Betts, Clinical Professor, Drexel University School of Education. It was delivered at the PADLA Annual Conference and Expo. PADLA is the PA/DE/NJ chapter of the United States Distance Learning Association. "Winter Moon" by Rhonda Lorence - from the new age viola album "Winter Moon"